The best sushi is akin to magic. What you see is simple. What you taste is not. A piece of raw fish is transformed by the smallest details — exquisite knife work, perfect rice, the barest lick of wasabi — into something remarkable. So it was at Onoda Sho-Ten, a somewhat hidden, seriously smoky and cramped restaurant steps away from the Nakameguro station. 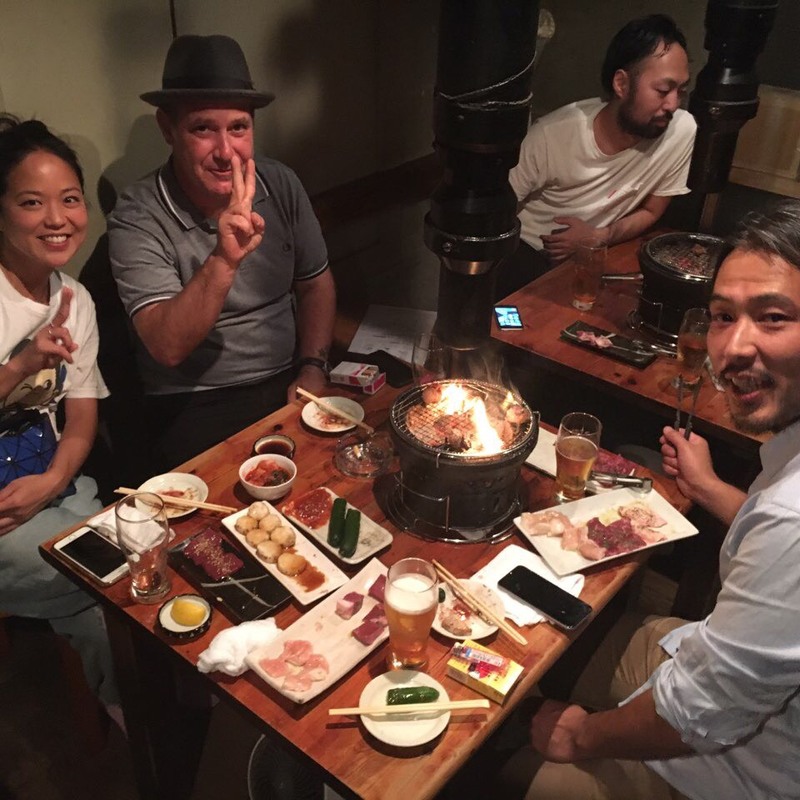 Instead of fish, Onoda serves meat — meat that you grill yourself over bin chotan charcoal. And, while they serve the choice cuts, the specialty is horumon — a Japanese term for discarded goods: hearts, lung, intestines, stomach, uterus and other offal from cows, pigs and other animals. The trash essentially. The stuff that rich people threw out or gave to the servants. I have always loved Yakiniku — essentially a Japanese adaption of Korean barbecue. Smoky rooms with yummy meats grilling, people talking too loud, cigarette ash tumbling onto tabletops, hoarse laughs being silenced by the approach of the next dish, frozen glasses of beer and shochu. It is celebratory food meant to be devoured with groups of friends. I have had great Yakiniku and Korean barbecue in New York and Japan that left me dreaming of the taste of perfectly marbled beef, seared just right so that the fat exploded with flavor. But, I have never been transported to higher place, a higher understanding of the chef’s art as I was at Onoda. We started with tongue, mountain yam, liver, harami (diaphragn) and “soft bone” (some sort of beef cartilage). First off the grill was the mountain yam. This is not something I typically enjoy. But, as I ate that first bite, I recognized that I was somewhere special. Something, something in the seasoning drew out the flavors of the yam, showcasing a depth that I had never previously experienced — a mountain yam, essentially in its ideal form. Tongue followed, dappled with a few drops of lemon: dense, beefy, an undercurrent of minerality. I heard my friend ask as she lifted a piece of tongue: “Is there a sauce for the meat?” That question died on her lips as she chewed. I pounded the table with delight. Liver, almost snapping with freshness and lightly charred at its edges, produced a mellow, subtle, almost soothing balm of flavors. Harami, somehow both tender and chewy at the same time, solved some sort of deep and dark Talmudic riddle on the nature of beef. And the soft bone…unexplainable…remarkable…defying you to explain exactly what was giving you such deep satisfaction in a densely intertwined play of flavor and texture. My response was to clap. What else do you do? Clap for what mysteries were unfolding in my mouth and satisfying that deep, remote lizard core of my brain. The next act arrived: beef heart, okra, cucumbers with miso, kim chee, beef intestine, second stomach, pork belly. The beef intestine was turned “inside out” so they appeared as pillows of delicious fat girded with a general chew — followed with the acidic tang of kim chee, it made for a combination punch worthy of Sugar Ray Leonard. The heart was tender, redolent of beef and iron. Second stomach is chewy, dense with collagen (promoted as something women should eat to firm up the skin!) and grilled to a char. Okra was simply the best okra I have ever eaten — both crisp, with seeds popping like caviar, and slimy. Cucumber, refreshing and cleansing. Pork Belly, unctuous and decadent. As a desert, we ordered up some perfectly marbled kalbi i.e. sliced short rib. By starting with the horumon, the kalbi revealed itself in its glory — an amused aristocrat wandering through a party of complex, infuriating, fascinating Trotskyite intellectuals. Lastly we were presented with a bowl of rice topped with a raw egg and a bowl of broth — dark and murky — also with rice. The egg rice was mixed, the rich yolk slicking each kernel and each bite revealed subtle flavors of sesame and soy. The broth was deep and unknowable — a heavenly concoction of long simmered bones, trimmings, organ meats tempered with the sharp crunch of slivered green onion. The chef at Onada, is an impish, bald 40ish guy manning the counter space with smiles. He is also a master. This was (with the exception of the rice and broth) a meal of raw meats and vegetables cooked at the table. Each ingredient was perfectly butchered, perfectly selected and, with the knowledge of one blessed with a palette like a motion detector so sensitive it could detect a cotton fiber hitting the floor, perfectly seasoned; the result was that ingredient reveled itself as the best possible version of itself — the subtleties of the seasoning (different kinds of salt, white pepper, black pepper, a dash of yuzu?) blending with fire and charcoal smoke became the whispered spell of an alchemist turning the pedestrian into the divine. The meal, like a magical sushi tasting, was so exacting and perfect in its simplicity that the enormous skill of it all becomes invisible. It was one of the finest meals of my life. Brilliant!!!! It is a thrill to read– you’re excitement jumps off the page. Motion detector/cotton fiber!!!!!! Makes me think I could actually enjoy yams and liver. You would enjoy them here!